It's not really like me to get so heavily into a trend, particularly when it's a print. I get restless when I spend too much on a particular style. 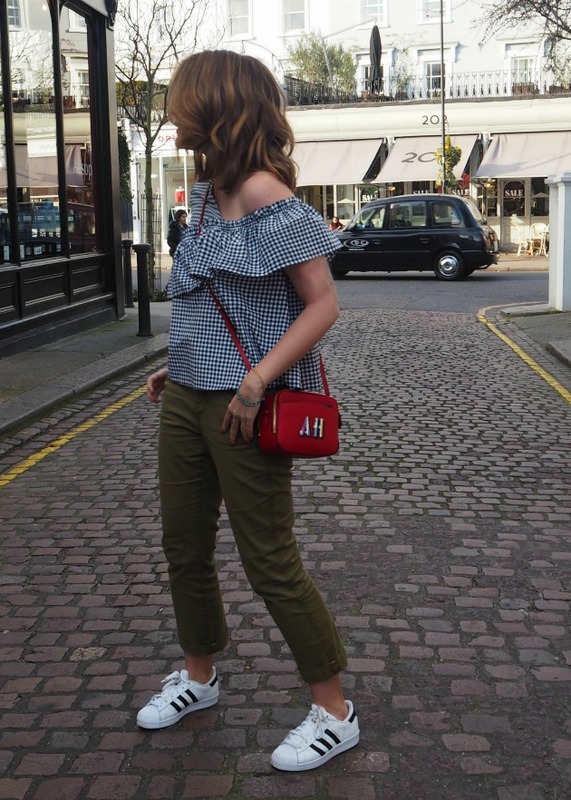 But I've figured gingham will be around for a while, I've spotted them in quite a few of the collections from the fashion weeks just gone (which means the trend will carry on for at least this year). Along with the skirt, I've also bought a jumpsuit from ASOS which I plan to wear soon, here. It's got quite open shoulders so I've been keeping it for a sunny day. Which hopefully is a realistic dream! The chinos are the superstars from J Crew, again. Lots of you have said you've bought them and they've sold out on Net A Porter but you can find exactly the same ones from their new collection here. They are proving to be so useful and a great alternative to jeans. Believe it or not I am actually trying to cut down on the trainer wearing but my new Superstars and I can't seem to be parted for long. They're unbelievably comfortably and somehow work-acceptable in my industry. I doubt that's true for you all, but if you're looking for a smart sneaker, find them here. The sunglasses are new from Tommy Hilfiger, here. Not sure about you but I'm loving any opportunity to get more on board with Tommy. Thats not something I ever thought I'd say either but thats what Gigi Hadid can do to a brand. For me, they've gone from memories of my first ever perfume and dressing pretty awfully - so wanting to bathe myself and my imaginary long limbs/abs in all thing preppy, navy and red. On that, it's now 10 weeks to Zanzibar and I'm on a mission. I say that now, but my gym has closed for 6 weeks so I'm in desperate need of any fitness at-home ideas or classes in and around Hampstead. Hit me up if you know of any! Photos taken using the Olympus PL7 here.